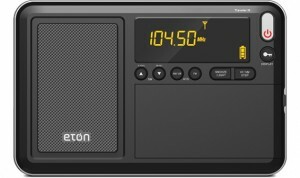 The Etón Traveler III is the latest compact travel radio by Etón Corporation (Grundig G8 Traveler II was the previous model). New to this model of the traveler is RDS (Radio Data System) which enables FM broadcasters to transmit digital data, like the station’s call letters, style of music, song title, artist and more. The Etón Traveler III should be available by September 8, 2014. This entry was posted in Eton, Grundig, Portable, Portables and tagged Eton, Eton Traveler III, Grundig, Portable, RDS, Traveler III. Bookmark the permalink.